This brand new Annual Plant Reviews volume is the second edition of the highly successful and well-received Functions of Plant Secondary Metabolites and their Exploitation in Biotechnology (Annual Plant Reviews, Volume 3). This exciting new volume provides an up-to-date survey of the functions of plant secondary metabolites, their modes of action and their use in pharmacology as molecular probes, in medicine as therapeutic agents, and in agriculture as biorational pesticides. The possibilities to produce valuable natural products in plant cell and tissue culture and even in recombinant microorganisms are also reviewed. 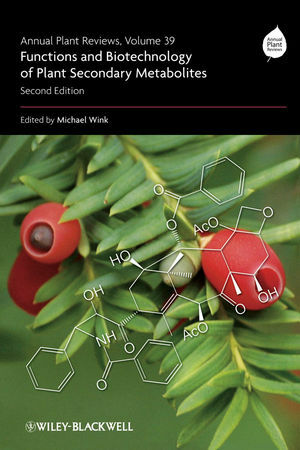 This carefully compiled new edition brings together chapters from some of the world’s leading experts in plant secondary metabolites. Completely revised and brought right up to date with much new information, this volume is an essential purchase for advanced students, researchers and professionals in biochemistry, physiology, molecular biology, genetics, plant sciences, agriculture, medicine, pharmacology and pharmacy, working in the academic and industrial sectors, including those working in the pesticide and pharmaceutical industries. Libraries in all universities and research establishments where these subjects are studied and taught will need copies of this excellent volume on their shelves.